Growing companies need to hire and retain great employees. Survey after survey attributes keeping the right people in the right jobs with company longevity and profitability. However, with limited resources and low brand recognition, small and medium-sized businesses find it hard to compete. And they can’t afford hiring missteps or high levels of turnover. Therefore, you need act—now—to start adding value with every hire. 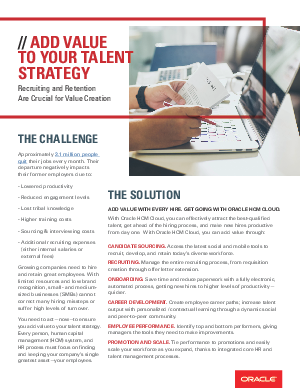 Technology can help you recruit and retain the right way.